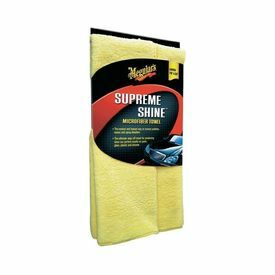 Meguiar's Supreme Shine Microfiber Towel is an incredibly plush microfiber towel for producing swirl free, mirror-like results. The thick, deep dual-sided microfiber pile absorbs two times more than traditional terry towels providing faster wipe off with less strokes. Description Meguiar's Supreme Shine Microfiber Towel is an incredibly plush microfiber towel for producing swirl free, mirror-like results. The thick, deep dual-sided microfiber pile absorbs two times more than traditional terry towels providing faster wipe off with less strokes. Produces a mirror-like shine on all finishes Thick, deep pile has more absorbency Safety edging prevents scratching Pre-washed for maximum absorbency Size : 16" x 24"